Chinese chive seed (Jiuzi)-Allium tuberosum Rottl. Botanical Name: Allium tuberosum Rottl. Source of Earliest Record: Bencao Jingji Zhi. Part Used & Method for Pharmaceutical Preparations: The seeds are collected in autumn, and then dried in the sun or fried. 1. Deficiency of kidney yang manifested as impotence and cold pain in the lower back and knees. 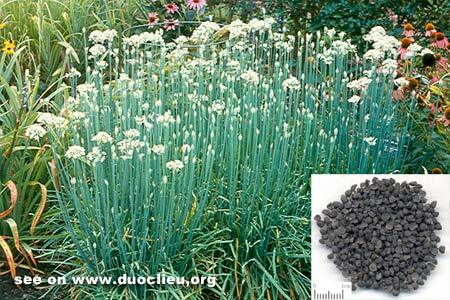 Chinese chive seed (Jiuzi) is used with Cistanche (Roucongrong) and Morinda root (Bajitian). 2. Frequent urination or leukorrhea due to deficient kidneys. Chinese chive seed (Jiuzi) is used with Psoralea fruit (Buguzhi), Dioscorea (Shanyao) and Bitter cardamom (Yizhiren). Dosage: 5-10 g (for decoction or pills). Cautions & Contraindications: The herb is contraindicated in cases with deficiency of yin with excessive fire.